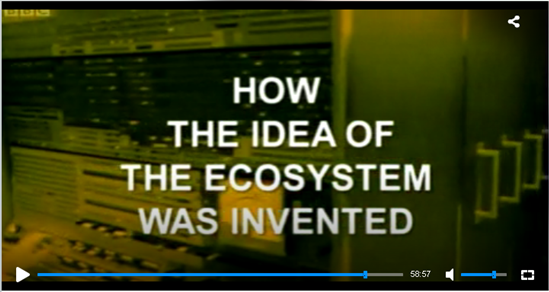 Article in The Observer “How the ‘ecosystem’ myth has been used for sinister means” by Adam Curtis. Check also out this Curtis interview. Broadcast on BBC Two, 9:00 p.m. Monday, 30 May 2011: A series of films exploring the idea that we have been colonised by the machines we have built. Although we don’t realise it, the way we see everything in the world today is through the eyes of the computers. But in an age disillusioned with politics, the self-regulating ecosystem has become the model for utopian ideas of human ‘self-organizing networks’ – dreams of new ways of organising societies without leaders, as in the Facebook and Twitter revolutions, and in global visions of connectivity like the Gaia theory. This powerful idea emerged out of the hippie communes in America in the 1960s, and from counterculture computer scientists who believed that global webs of computers could liberate the world. But, at the very moment this was happening, the science of ecology discovered that the theory of the self-regulating ecosystem wasn’t true. Instead they found that nature was really dynamic and constantly changing in unpredictable ways. But the dream of the self-organizing network had by now captured our imaginations – because it offered an alternative to the dangerous and discredited ideas of politics. Check out Stephen Duncombe’s excellent piece “Adam Curtis: Dystopian Dialectics, ” Photoworks, Jan 15, 2014. Entry filed under: Media, News, Press, Video. Tags: colonization, computers, ecosystem, humans, machines, nature, planet, politics, science, self-organizing networks, vegetation. Do you have any prove (a letter or something) that Tansley simply projected his ideas on the mind onto the ecosystem? Basically, his proposal of the ecosystem concept is as void as Haeckel’s definition of ecology. It is just that, a definition. Tansley (1935, The use and abuse of vegetational concepts and terms) did not suggest that ecosystems were organised into networks nor did he say anything about energy flow through the system. So I wonder whether you have any additional information not to be found in the sanitized scientific publications. I relly liked your book very much except for this small detail. Take a look at this blog entry (http://historiesofecology.blogspot.com/2011/08/use-and-abuse-of-tansleys-concept-and.html) and you’ll find all the reasons why I did not find any evidence concerning this particular claim of an analogous transfer either in your book or in the publications of Tansley. Yes, there are intriguing images of mental networks in Tansley’s ‘New Psychology’ that will intrigue any ecologist. But there is no food web or network structure in his ecosystem concept suggesting an analogous transfer from psychology into ecology. His talk presented to the Magdalen Philosophy club in 1932 (which you laudably prepared for publication in 2002) also did not suggest such a transfer to me. Ok, this is nit-picking in a book I really liked very much, but maybe we can have an educated discussion about this issue. In my opinion, Tansley left his ecosystem concept entirely empty of any internal strucure, a mere definition, and the filling was provided later. Hi Joe, I am glad you enjoyed my “Imperial Ecology” book. I agree with you that Tansley’s version of the ecosystem was rather empty compared with later elaborations done by ecologists. Yes, indeed, “the filling was provided later” by the Odum brothers and others. I think Tansley very much believed in the old – and today much dated – idea that “ontogeny recapitulates phylogeny” (that stages in the development of a human being recapitulates evolution in nature), which explains his fascination with psychology and all the analogies he made between human behavior and ecological changes. I wrote a short summary of this argument that might interest you: “From social psychology to ecology”.